Despaña Brand Foods, the Queens-based importer and manufacturer of Spanish food products, is branching out with a new Manhattan store opening today on the eastern edge of Soho. The company, which has been in the business of importing and producing Spanish specialties for 35 years, is a major wholesale supplier to New York City restaurants, including Casa Mono, Bar Jamon, and Daniel. Four years ago, owners Marcos and Angelica Intriago opened a tiny retail shop in Jackson Heights (previously featured here). "We found that more and more people were getting interested in our products," Ms. Intriago told me. "But, we just didn't have the kind of space to do what we wanted to do there." The bright new 1,500 square foot space, awash in sunlight, carries a wide range of imported Spanish products, including Serrano ham, olive oils, vinegars, and cheeses, along with specialty items like honeys from the island of Tenerife in the Canary Islands and Calasparra rice, a super-absorbent short grain rice that is perfect for paella. Despaña’s own line of house-made chorizo and morcilla, blood pudding, are available, along with imported dry-cured chorizo and lomo, dry-cured pork loin. If you find your appetite growing while perusing the shop, you can bite into bocadillos, small sandwiches stuffed with cured meats and cheeses. 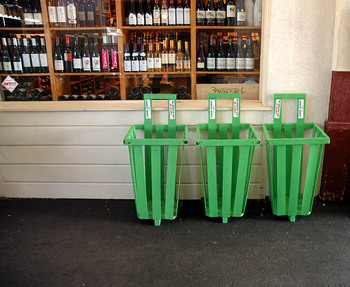 There are also plans for a regular series of in-store tastings of the shop's products. "You can find Spanish ingredients in gourmet stores, but you can’t find them all in one place," says Ms. Intriago. "Now, this will be your best bet for all of the special things people crave from Spain." 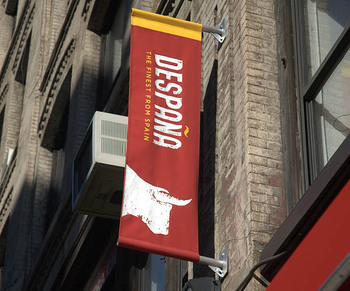 Despaña, 408 Broome Street, between Lafayette Street and Cleveland Place (212.219.5050). 2. Flavor Combinations With Champagne, Cognac and Cheese, the Artisanal Premium Cheese Center will present a discussion and tasting of cheeses paired with cognac and champagne, Wednesday, January 25, 6:30 to 8:30 p.m, at the Artisanal Premium Cheese Center, 500 West 37th Street, 2nd Floor. $75/person (877.797.1200). 3. Cooking with Conifers: Piñon, Juniper & Cedar, chef Pam Carey will give a lesson on cooking with berries and nuts produced by conifer trees, Sunday, January 29, 2:00 p.m., at Wave Hill, West 249th Street and Independence Avenue. Free with admission to Wave Hill (718.549.3200). 4. La Galette des Rois, learn about the social, religious, and cultural history of La Galette des Rois (the Kings’ cake) and taste galettes from François Payard of Patisserie Payard, and Richard Dumas of Dumas Pâtisserie & Associates, Monday, January 30, 6:00 to 8:00 p.m., at the French Institute Alliance Francaise (FIAF), Tinker Auditorium, 55 East 59th Street. FIAF members/$30, non-members/$45. Seating is limited, and tickets must be purchased by Thursday, January 26 (646.388.6669). 5. "Notes" from the Underground: Wines the Vintners and Wine Merchants Drink (and usually reserve for themselves), wine merchants reveal their wine imbibing secrets (hors d'oeuvres included), Tuesday, January 31, 6:30 to 8:30 p.m., at the Merchant's House Museum, 29 East Fourth Street. $35/person, reservations required (212.777.1089). 6. Gastronomy and Gluttony in Early Modern China, The Culinary Historians of New York will present a lecture by Joanna Waley-Cohen, Professor of History, New York University, on cuisine and consumerism in Chinese history, Tuesday, January 31, 7:00 p.m., at Park Avenue United Methodist Church, 106 E. 86th Street, 3rd Floor. $35/person (212.334.4175). 7. Chef Tasting Series: Marc Meyer, Cookshop's Marc Meyer will prepare selections from the restaurant’s snack menu paired with wine, Tuesday, January 31, 6:00 to 8:00 p.m., at Appellation Wine & Spirits, 156 Tenth Avenue. Free (212.741.9474). 1. Restaurants from the Inside Out, WNYC's Leonard Lopate will moderate a discussion between chef Rocco DiSpirito, eGullet.org founder Steven Shaw, and author Calvin Trillin, Thursday, January 12, 8:00 p.m., at the Kaufmann Concert Hall at the 92nd Street Y, 92nd Street at Lexington Avenue. $25/person (212.415.5500). 2. Great Gifts of the Basque, a special tasting featuring Basque cheeses paired with Basque wines will take place on Thursday, January 12, 6:30 p.m. to 8:30 p.m., at the Artisanal Premium Cheese Center, 500 West 37th Street. $75/person (877.797.1200). 3. Black Truffle Gala Dinner, to celebrate the arrival of black truffle season, chef Ed Brown will present a five-course menu featuring truffles he personally harvested in Provence, Tuesday, January 17, 6:30 p.m. to 10:00 p.m., at The Sea Grill in Rockefeller Center. $250/person (212.332.7610). Here's some exciting news: I will be a guest on WNYC's Leonard Lopate Show on Tuesday, January 10, for a discussion of food blogs. Gourmet magazine editor-in-chief Ruth Reichl will be in the studio, along with several food bloggers, to talk about the online phenomenon. The segment will air live tomorrow at 12:00 p.m. on 93.9 FM. You can listen to the show on the radio, via streaming audio through WNYC's website, or by podcast. Updated: Hey, I survived my first radio appearance! An mp3 recording of the show is now available for download at WNYC. The Food Section (along with The Accidental Hedonist, Chocolate & Zucchini, Too Many Chefs, An Obsession with Food, Slice, and Orangette) were featured in a roundup of food blogs appearing in the January 8 issue of USA Weekend. The Sunday magazine insert appears locally in Newsday. Run by Josh Friedland, this award-winning blog touts itself as "All the News That's Fit to Eat." 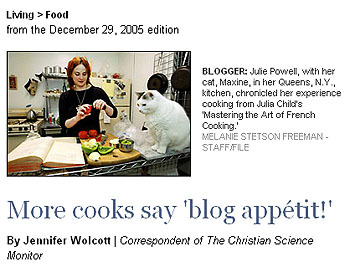 It's what is referred to as a filter blog, which posts a variety of food-industry information -- from recipes to articles to a calendar of food events (in the New York City area). 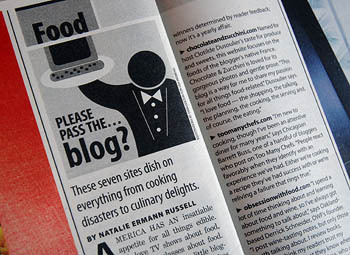 Gourmet magazine calls it "the consummate gastronomic blog." My wife has one of those ingrained childhood associations of prunes with prune juice that has left her avoiding the fruit in her adult life. What's more, the marketing efforts by the prune industry to re-brand the fruit as "dried plums" have been a total loss in her case. "They're still prunes," she would tell me. 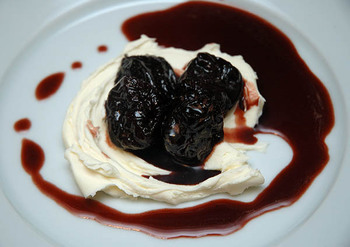 But, when I saw her try (and, better yet, actually enjoy) a dessert of prunes cooked in red wine and served with mascarpone at Frankies 457 Spuntino (457 Court Street, Carroll Gardens, Brooklyn), I felt a tinge of victory that prunes had penetrated her culinary conscious. I recently attempted a reconstruction of the dish at home and succeeded through sheer improvisation, particularly since we did not have any red wine on hand. Instead, I used port, and although port can be saccharine and potentially exaggerate the super-sweetness prunes, I found that adding lemon cut the sugar, added some acidity, and brought a touch of tartness. I made up the recipe on the fly, so the measurements that follow aren't exact. The technique's the thing, starting with reducing about 1 to 1 1/2 cups of port over medium heat. As the alcohol burned away (watch out for a flame-up), I added two cloves, a cinnamon stick, and enough sugar to fill my palm. 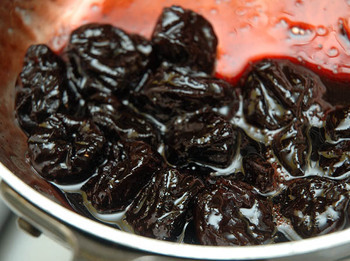 When the port had reduced by almost half, I strained out the spices and added about a dozen prunes, continuing to cook the sauce down until it became a thick syrup. At this point, I added the juice of one half of a lemon to tame the sweetness. If the sauce gets too thick and threatens to turn from a syrup into something closer to tar, just stir in some water. When it finally had the right consistency, I removed the pan from the heat. You can stop here if you'd like and refrigerate everything, reheating the prunes and sauce for serving later. Spread 1 to 2 tablespoons of mascarpone onto the middle of a plate (or, if you want to be fancy, form quenelles with the cheese), and layer the prunes on top, spooning the sweet sauce over and around the mascarpone. Warm, sweet fruit and cool, creamy mascarpone -- a combination even a lifelong prunophobe can't resist. Restaurants from the Inside Out, WNYC's Leonard Lopate will moderate a discussion between chef Rocco DiSpirito, eGullet.org founder Steven Shaw, and author Calvin Trillin, Thursday, January 12, 8:00 p.m., at the Kaufmann Concert Hall at the 92nd Street Y, 92nd Street at Lexington Avenue. $25/person (212.415.5500). 1. To Grow or Not to Grow, New York Times Dining In/Dining Out reporter Kim Severson will interview chefs Bobby Flay, Kurt Gutenbrunner, and Karen Waltuck about "the lures and perils of expansion in the restaurant business," Saturday, January 7, 2:00 p.m., at the Graduate Center-CUNY, Fifth Avenue & 34th Street $20-30/person (888.NYT.1870). 2. Not Your Typical Goat, Laini Fondiller of Lazy Lady Farms in Vermont will discuss goat cheese varieties on Monday, January 9, 6:30 to 8:00 p.m., at Murray's Cheese, 254 Bleecker Street. $50/person (212.243.3289, ext. 25). 3. How To Pull a Shot, Joe: The Art of Coffee will present a hands-on workshop on everything you ever wanted to know about espresso (but were afraid to ask), Tuesday, January 10, 7:00 p.m., at Joe, 9 East 13th Street. Space is limited to 20 people, reservations and prepayment required. $10/person (212.924.7400 or joecoffeestore@aol.com). Josh Friedland's slogan "All the News That's Fit to Eat," sums it up. His site is chock full of information, especially about the New York food scene. For foodies visiting the Big Apple, this site's calendar listings are a must-see.